Freeze away your unwanted fat with the FDA-cleared, non-surgical fat reduction treatment, CoolSculpting! Now available at Refine MD, this revolutionary body contouring method targets fat and naturally eliminates it for your body. With safe and effective CoolSculpting you will see undeniable results in as little as one treatment. Get rid of stubborn fat…no surgery or downtime needed! How does CoolSculpting Work to reduce unwanted fat? With this revolutionary process, only the fat cells are frozen, without damaging your healthy skin. In the weeks and months following treatment, the targeted fat cells are naturally eliminated from your body. This non-invasive procedure requires no surgery or suctioning. Each treatment will result in a visible reduction of stubborn fat in the treated area, with continued improvement over the next few weeks and months. The average treatment takes about 1 hour. During the first few minutes, you will feel pressure and cold, but this soon dissipates as the area naturally becomes numb from the cold. Many patients read, work on their laptop, or even take a nap during a treatment. How is it different from liposuction like SmartLipo or ProLipo? CoolSculpting is a totally non-invasive treatment that requires no surgery, suctioning, anesthesia or downtime. Fat cells are eliminated below the skin’s surface, without damage to the skin. Depending on your goals, it can be an alternative way to lose fat and inches. During your complimentary body contouring consultation at the Refine MD, we can help you determine which procedure best fits your body type and lifestyle. Am I a good candidate for CoolScupting non-surgical body sculpting at Refine MD? If you have areas of diet and exercise resistant unwanted body fat such as muffin top, bra fat or tummy pooch, CoolScupting may be right for you. It is not a solution for individuals who are obese and it is not a substitute for certain surgical treatments. During your consult, our physicians will determine if it is right for you. What is the cost of CoolSculpting at Refine MD? The cost varies according to the individual and the areas that are treated. To learn more, please request a consultation with us. 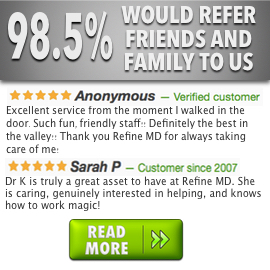 Where is Refine MD located? Refine MD is located in Menasha, WI and is convenient for residents of Calumet and Winnebago counties and Fox Cities towns like Appleton, Fox Valley, Green Bay and more.